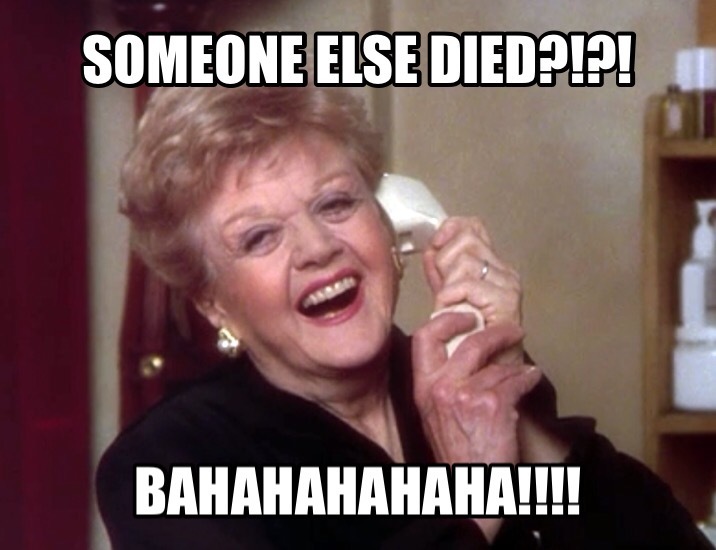 I’ve been binge watching Murder She Wrote for a while now. There are 264 episodes and at least one person was murdered on each episode, sometimes more than one. That means that over the course of 12 years (the shows run) over 264 people were murdered somewhere near Jessica Fletcher. If I was that woman I’d think I was cursed. I’d develop a freaking complex. I’d lock myself away from the rest of society. My hat is off to this crazy, old English teacher from Maine for keeping her crap together when people are dropping like flies all around her. We should sometime. Give me a call sometime! Never watched it might have to check it out.